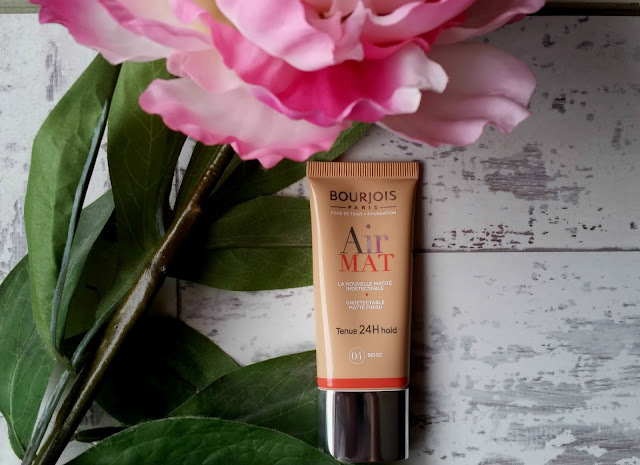 For the past couple of weeks I have been trying out this new foundation by Bourjois! This product caught my eye as soon as it came out - mainly with it being a matte foundation. Firstly the coverage seemed lovely, but not too heavy with a nice blend-able texture, so I thought I'd give it a go, I love finding a nice drugstore affordable foundation! On first impressions I thought it was very nice! I have the shade 04- beige which is a slight yellow toned foundation, but with some colour or tan on it was a great shade for me. I have tried applying this with both a brush and a damp beauty blender, but do recommend a stippling brush you get a great coverage with very little foundation! Once this makeup is applied it looks flawless, it is definitely a matte finish, but doesn't leave the skin looking thick of foundation or unnatural - I wasn't used to using a matte foundation which gave me these results, generally they are too matte and heavy or still leave a shine, so I was very happy! For the first couple of hours this foundation looks great! But as the day goes on you do find this wears off quite a bit! Considering it is meant to last 24 hours - I can't say this lasted well on my skin. In areas which produce more oil- chin, nose and forehead, it did seem to wear off quite a bit leaving it looking a little patchy in areas! This is such a shame because I love the texture and finish when I first apply this foundation but after using it for a little while now and trying a lot of different ways - primer, no primer and setting powder etc. It still doesn't seem to last! I think it will be great for those who don't have very oily skin or specifically want a long lasting foundation! I will definitely use it for when I only want to wear make-up for a few hours but for a full day look and evening wear it unfortunately doesn't work for me!